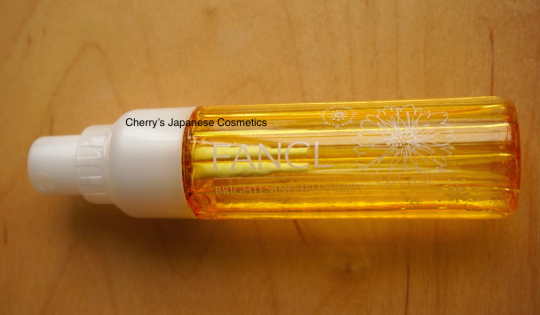 Fancl Brightening Jelly Mist is from Fancl Summer kit what we chose for Japanese Girl’s Beauty Box: May 2015. This is a spray style product. “Jelly” and “Mist”? I thought it is contradiction. I found what they wanna explain when I sprayed on my palm. Hmm, it is hard to know from this photo. Can you see “liquid” on my palm? It is far from runny. Do you know agar jelly? Not gelatin jelly. I guess this is near to agar jelly. This is the reason why they named this lotion as “Jelly”. So, such harder product, to use it, they chose “spray” style to apply. spray=mist. Usually I spray this “mist” directly to my face. Sticky? No. Perfume? I didn’t recognize. Stinger? Not for me. According to Fancl, they recommend to apply this product on daytime. In lunch time or something, do you fix your makeup? In Summer, your makeup is easy to running out, isn’t it? When you fix your makeup on lunch time, use this. Or in Summer, because of the strong air conditioning, your skin is quite easy to dry. So, spray this mist and moist your skin. In person, I used this as just a lotion when I travel. I really like walking inside of the city with seeing the locals’ life. And as a Japanese, I really doubt where I can fix my makeup. The restrooms in the mall? It is sad for me basically, in any of the countries, I really hesitate to use restrooms in abroad excluding in my emergency. Yeek! I used this as just a lotion. I spray this a lot on my face at my hotel. Being sticky face is not fun for me, and it was so good this product is neither sticky nor “heavy”. Totally to say, I liked this spray. See you in the next summer! I got a rumor that Fancl is going to sell this mist only. Please keep your eyes on out here: Fancl in JPY Branch.